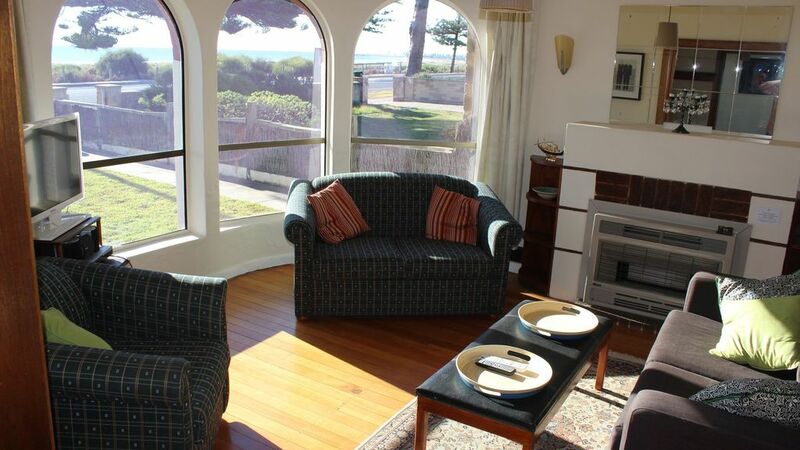 This art-deco cottage overlooking the sea provides premium accommodation for up to four guests. The fully self-contained facilities include lounge, dinning room, master bedroom, second bedroom, bathroom and kitchen. The house was built in 1937 and is furnished in keeping with this period. A 50mtr walk across the sand-hills enables guests to participate in beach life as well as observing it from the comfort of the lounge room and while lying in bed in the master bedroom. Hosts Peter & Carol live in a separate apartment at the rear of the property, and other than sharing the driveway, they only have contact with guests when called upon. Lovely, fully-equipped cottage. Fantastic location. Very thoughtful hosts. Throughly enjoyed our stay. Cottage was as described and checking in was made easy. Kitchen had everything we needed, comfy beds and comfortable lounge. The beach view from the lounge and bedroom window were lovely. All the comforts of home. Will definitely be back to stay.